Fine Art Limited Edition of 50 - The Jökulsárlón lake provides outstanding views of the ice cap, a vast dome of ice that rises to a height of 3,000 ft (910 m). It spills to the lagoon 12 mi (19 km) away from the jagged glacier hill to the edge of the water line. The lake developed only about 60 years ago (1948 is mentioned), when the entire area was less than 100 ft (30 m) of glacier, which was only 250 yd (230 m) from the Atlantic Ocean, and 2 mi (3.2 km) away from Vatnajökull. 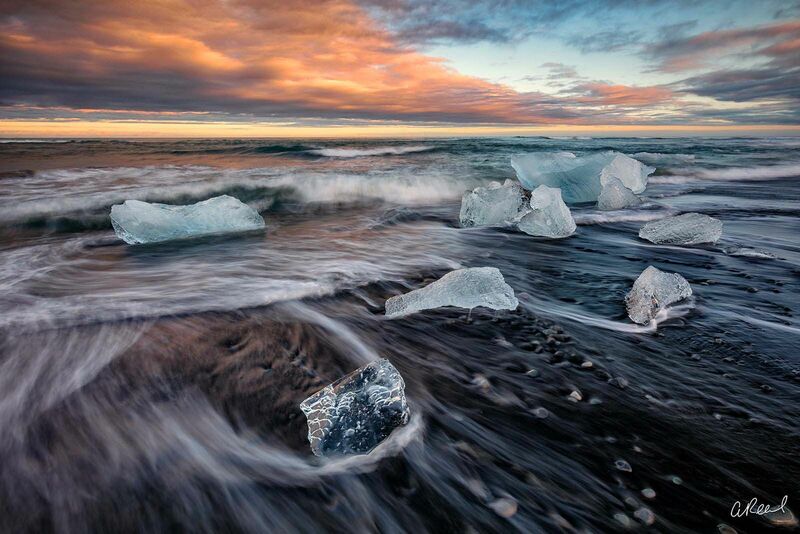 Vatnajökull was at the shore line of the ocean and dropped icebergs into the ocean. However, it started drifting inland rapidly every year, leaving deep gorges en route, which got filled with melted water and large chunks of ice. These icebergs gather at the mouth of the lake's shallow exit, melt down into smaller ice blocks, and roll out into the sea. Photo © copyright by Aaron Reed.